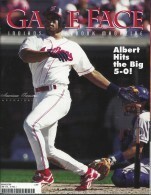 Albert Belle is on the cover this Game Face program. This program was available to buy during the 1996 season at Jacobs Field. Albert Belle has the feature article that is five pages long with a two page picture. If you have this program or want to get this program. You will want to look at the ads. The ads are always interesting and how advertising has changed. How Collectible is the 1996 Cleveland Indians Vol.10 No.1 Program? This Cleveland Indians program was the first issue of the 1996 and was sold during the month of April in 1996. This Cleveland Indians programis not a highly coveted Game Face program. This Cleveland Indians program is also affordable for all types of collectors. This is also the year the Cleveland Indians make another run to go to the World Series after losing in 1995 so this could later down the road become a coveted issue.